We’ll Keep You in Hot Water! Does your Lakeville, MN home need a new water heater or need the old water heater repaired? Since 1999, Aqueduct Plumbing Co. has been getting customers into hot water! Our service professionals will ensure that you have hot water when you need it, especially during cold Lakeville, MN winters. We provide repairs, installations and regular check-ups to keep you in hot water. Whether you need an electric, natural gas, or tankless water heater, we have the right one for your home. A water heater is an appliance that uses a thermodynamic process to convert energy sources such as gas, oil, or electricity to heat water above its’ initial temperature, but does not exceed 120F. The most common type of domestic water heater in the U.S. is the conventional storage water heater. Other types include tankless or demand-type water heaters, heat pump water heaters, solar thermal water heaters, and indirect water heaters. Aqueduct Plumbing Co. is a licensed water heater installer. We install all types of water heaters: electric water heaters, gas water heaters, and tankless water heaters. The most popular and traditional style of water heaters in Lakeville, MN and surrounding Dakota and Scott counties is a gas or electric storage tank unit. These units store just the right amount of hot water for your convenience. Aqueduct Plumbing Co. is the place to call at 952-469-1284 to help you find the right water heater for your residential or commercial needs in Lakeville, MN to keep you in hot water. Water heater installation by Aqueduct Plumbing Co. makes finding and installing a water heater in your home Lakeville, MN a pain-free process. We are a family owned business that has operated in Lakeville, MN since 1999, our professional plumbers have worked on with virtually every major brand and we are confident they can help you assess what is best for your Lakeville, MN water heating and conditioning needs. 24 Hour Turnaround Service: We typically can get a water heater installation specialist to your home the same day you request service provided it’s early enough. Licensed, Bonded and Insured Guarantee: Our plumbers are all licensed, bonded, and insured. As a local business we offer an unparalleled quality of work with competitive prices to meet your budget. We promise to take great care of your home or business. Our technicians put down coverings to protect your home. They are professionally trained and will clean their work area when they are finished with their job. To ensure your satisfaction, our professionals team at Aqueduct Plumbing Co. will follow up with a phone call to make sure everything is working as promised and answer any further questions you may have to keep the hot water flowing. When your electric or gas water heater acts up, it’s imperative that you contact a trustworthy Lakeville, MN plumber that can assess whether it will be more cost-effective to repair your water heater or if it is time to purchase a new one. 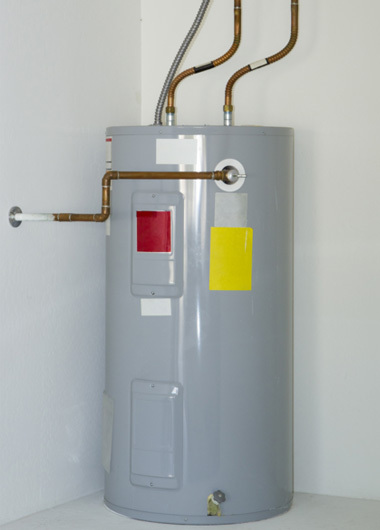 An old water heater may need frequent repairs, and depending on the situation, it may be wiser to invest in a new, more energy-efficient water heater. The plumbers at Aqueduct Plumbing Co. proudly offer professional water heater repair and replacement to Lakeville, MN and Dakota and Scott Counties. How do I know if I need water heater service? You frequently run out of hot water. You have no hot water at all. Water pools around the base of the water heater tank. Your water heater has to be relit frequently and will not stay lit. The water smells strange or has an unusual odor. You hear odd noises coming from the water heater tank. If your water heater is struggling to meet your hot water needs, contact Aqueduct Plumbing Co. for assistance. Our plumbing professionals are licensed, bonded and insured and will provide a free estimate and help you decide if it’s time to repair your existing water heater or consider water heater replacement. We can provide water heater maintenance to prevent harmful sediment build-up, as well diagnose problems and provide repairs. If you are in need of a water heater installation, our Lakeville, MN certified plumbers can help you choose the water heater that will perform the best for you. Contact Aqueduct Plumbing Co. at 952-469-1284.